Dear son Aanand is growing pretty well. Can’t believe he is 3 months old now! Time just flies away. The other day we were chatting with Panaji (great grandmom) via webchat. She mentioned that as the babies reach their milestones, its a customary that we prepare few dishes so to mark their achievement, enjoy and feel proud about it. It seems somas is prepared when the babies turn to their sides. Why somas? God only knows Probably it resembles a child lying on his sides… (he he pardon my vague idea…) Aanand accomplished this milestonse long back, within couple of weeks since he was born. 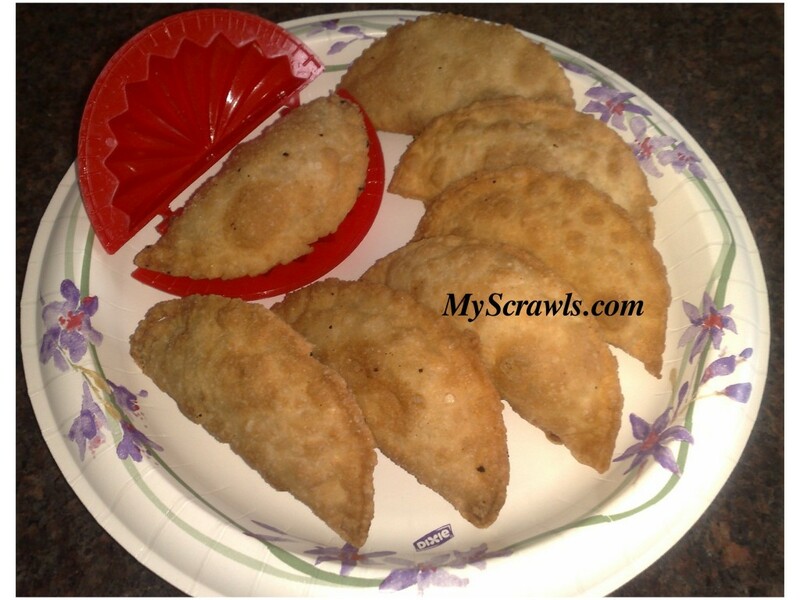 Here I share the somas recipe and my happiness as a proud mother with you all. Roast rava and powder it. Mix the powdered rava with maida. Add water and prepare a dough (Just like we do for making puris). Make small balls out of the dough and roll it (small ones as puris). Place the flattened dough on the somas presser. Keep the puran and close it. Remove extra dough protruding from the sides of the somas presser. Now remove the somas from the presser and deep fry it. Delicious somas is ready to relish. Roll the dough as puris. Keep the puran in the middle. Fold the dough (as a semi circle) and stick the ends with little oil. I have had these but never made them. Looks delicious! Recipe is good nd tastes good too! Panaji may go ecstatic over how it was when hergrand kids were 3 months old! This dish seems to be all about continuity of tradition and tastes of tradition too! My preference may be to jaggery instead of sugar& KhasKhasa. And it being fried till the browny lump shows itself prominently inside the fried somasi! Keep it up inspite of my being nosey! Enjoy! Not a dish for 3 months old.In his name we relish,yea more than somasi! Your somas looks similar to a Malaysian favourite called Currypuff, the dough made of maida, the stuffing can be made of potatoes or sometimes sweet potatoes, fried with dry curried style and very much similar presser used to . Thanks Sathiarani Yes Am definitely enjoying motherhood! Wow Kozhukattai to celebrate the first tooth! Aanand already has 4, so what?? will make modakams and enjoy Oh never heard of Currypuff… sounds inviting!! Thanks again for the info about the Malaysian cusine. Do keep in touch!